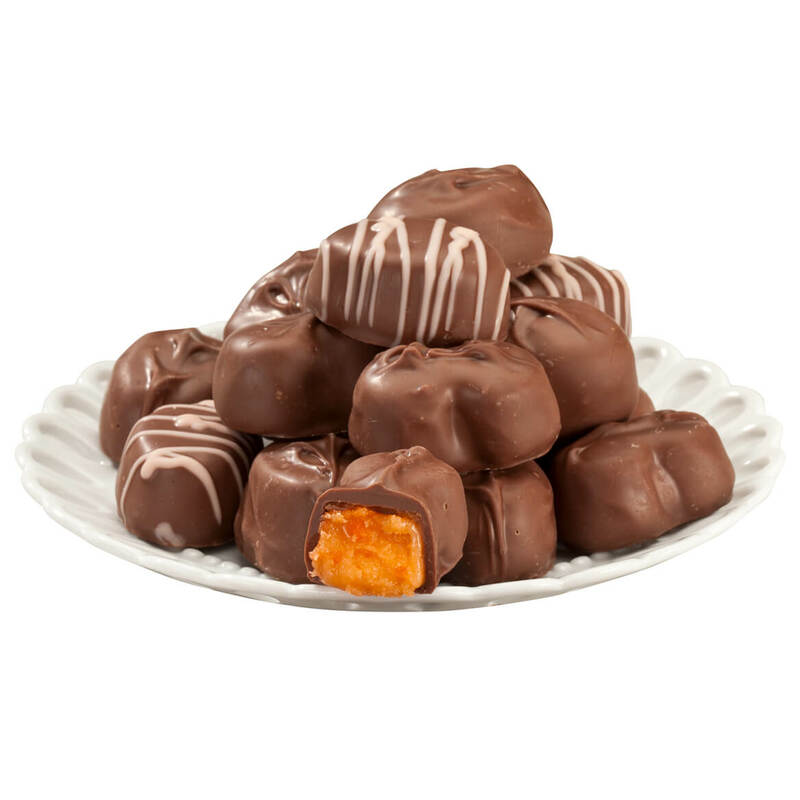 Prepared from The Peanut Shop®’s own special recipe, these bite-size bits of Virginia peanut brittle are panned in creamy gourmet chocolate to a luxurious sheen, packed at the peak of freshness and out-of-this-world delicious! 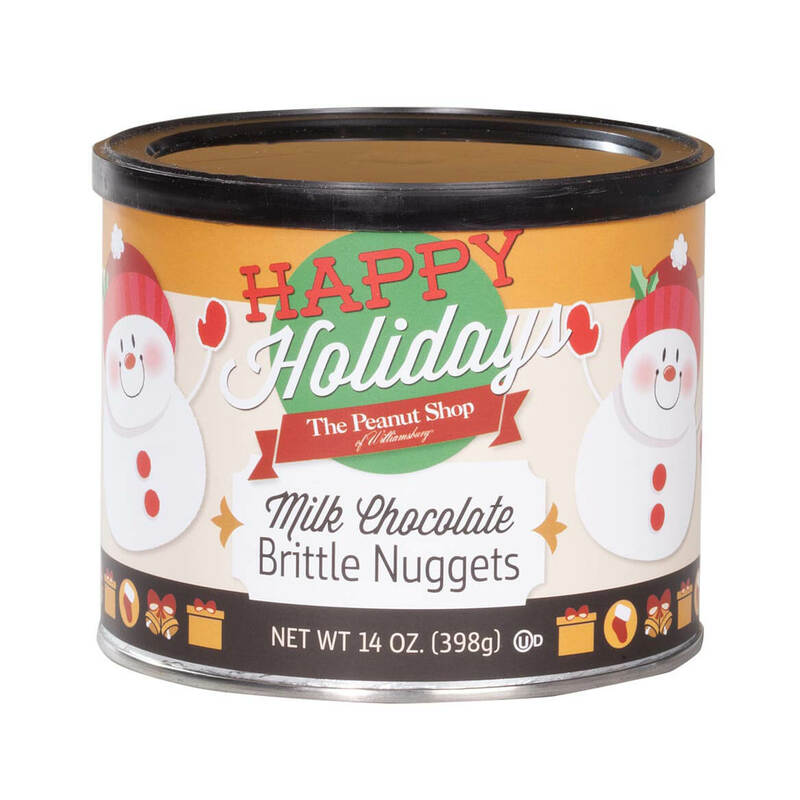 The festive tin makes the perfect grab-and-go hostess gift, and you’ll can share these yummy The Peanut Shop® Happy Holidays Milk Chocolate Brittle Nuggets with pride (but they’ll disappear quickly, so you may need several!). 14 oz. 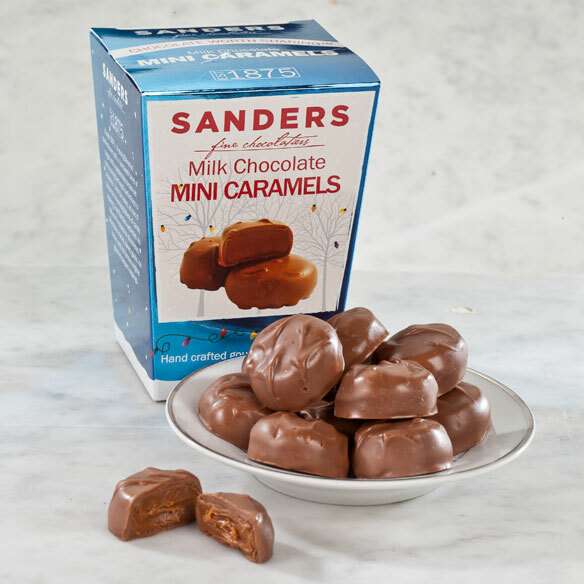 The only thing better than Sanders buttery, kettle-fresh caramel is when it’s deliciously drenched in creamy, dreamy gourmet chocolate! Cooked slowly in small batches with the finest ingredients, these luscious milk chocolate mini caramels deliver gourmet chocolate goodness by the handful. Boxed for holiday giving, each chocolate caramel is a sweet little luxury you’ll be proud to share. 6 oz. 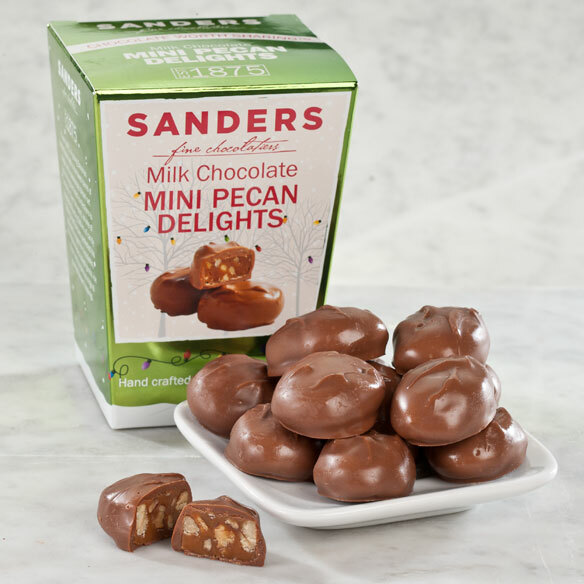 Share the gift of tender southern pecans swirled in world-famous Sanders milk chocolate … but do remember to enjoy a few yourself! Living up to the name “Delights”, these luscious confections are handcrafted in small batches with the finest, kitchen-fresh ingredients and impossible to resist. Beautifully packaged for holiday giving, they’re fun for stockings, party favors, thoughtful gifts and joyful “just-because” snacks. 6 oz. 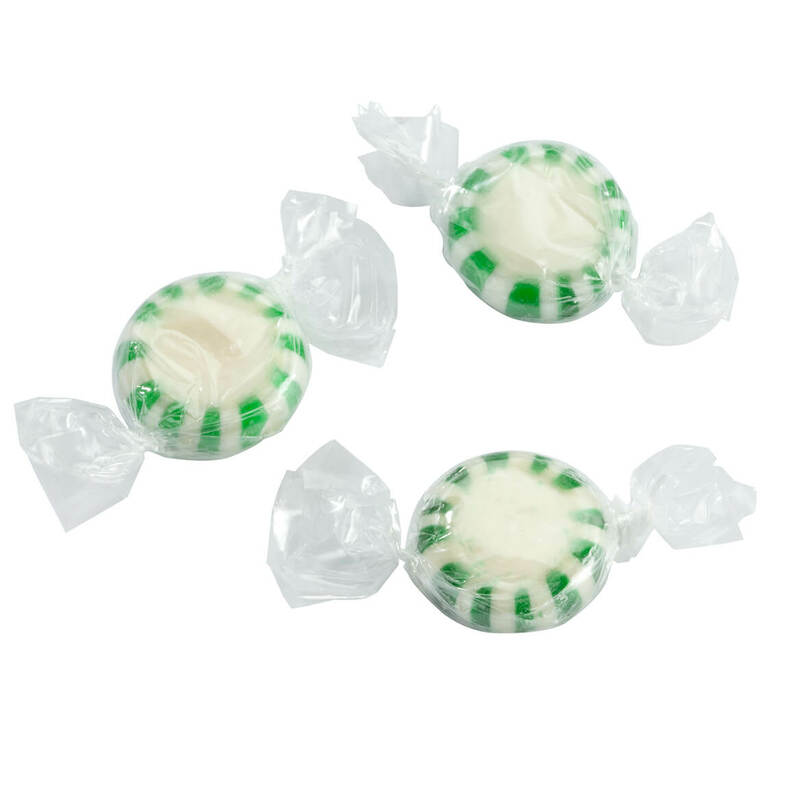 These Spearmint Starlite Mints by Mrs. Kimball’s Candy Shoppe™ have all the breath-freshening, throat-soothing goodness of their red-and-white cousins … but in cool spearmint flavor. Made the old fashioned way with natural, genuine spearmint oil, nostalgic spearmint candies offer smooth, long-lasting flavor you’ll love after dinner or any time you want a sweet, satisfying treat. Individually wrapped for freshness, they’re the unsung hero of any candy dish and a must for desk drawer, pocket or purse! 20 oz. Boasting the finest ingredients and a 109-year-old family recipe, these world-famous Texas Chewie® pecan pralines boast rich, buttery caramel and large, premium Texas pecans. Cooked to perfection in old-time copper kettles, the sweet, nutty Texas pecan pralines are individually wrapped, packed in a gift box, and destined to disappear quickly! 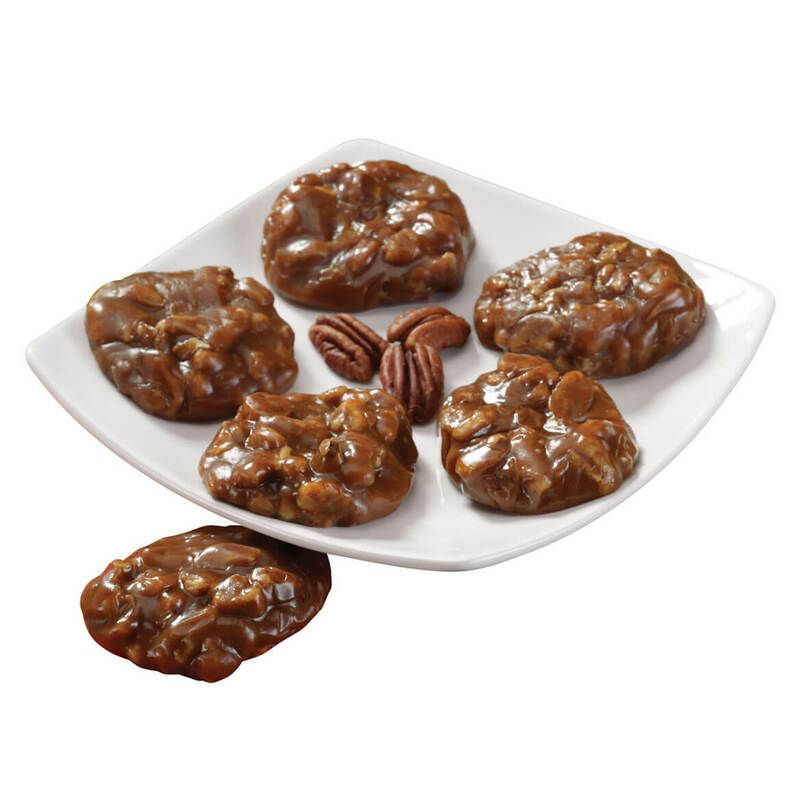 These Texas pralines are also available with a light, creamy coating of milk chocolate. 6 oz. These luscious chocolate fudge frogs are little “prince charmings,” sure to lure you in with their smooth, minty exteriors, then completely enthrall you with rich, decadent fudge centers. 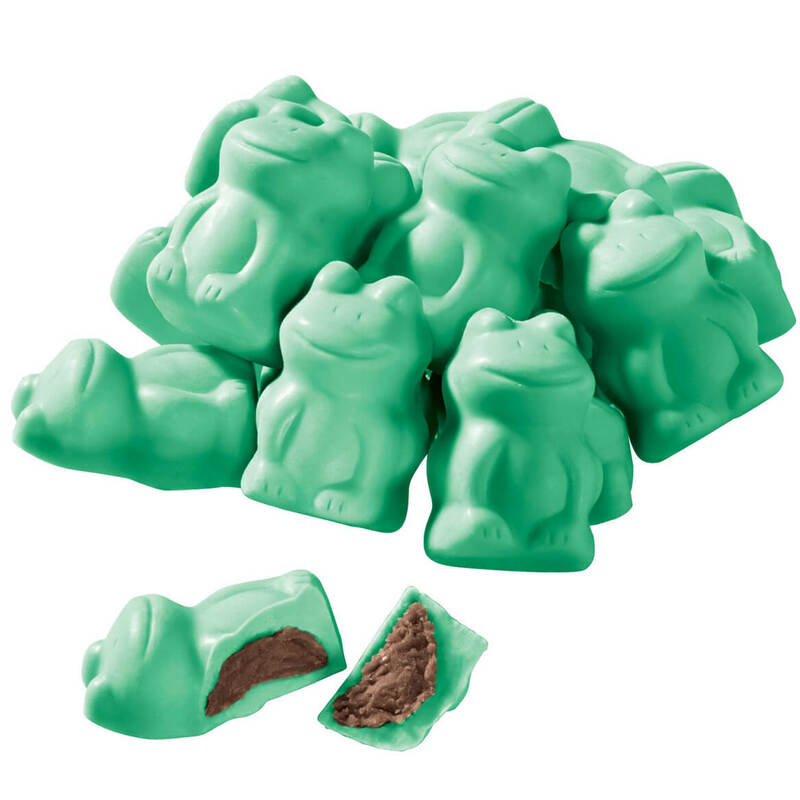 Mint chocolate frogs are adorable and delightful for giving or serving, they’re love at first sight … pure bliss at first bite. 6 oz. 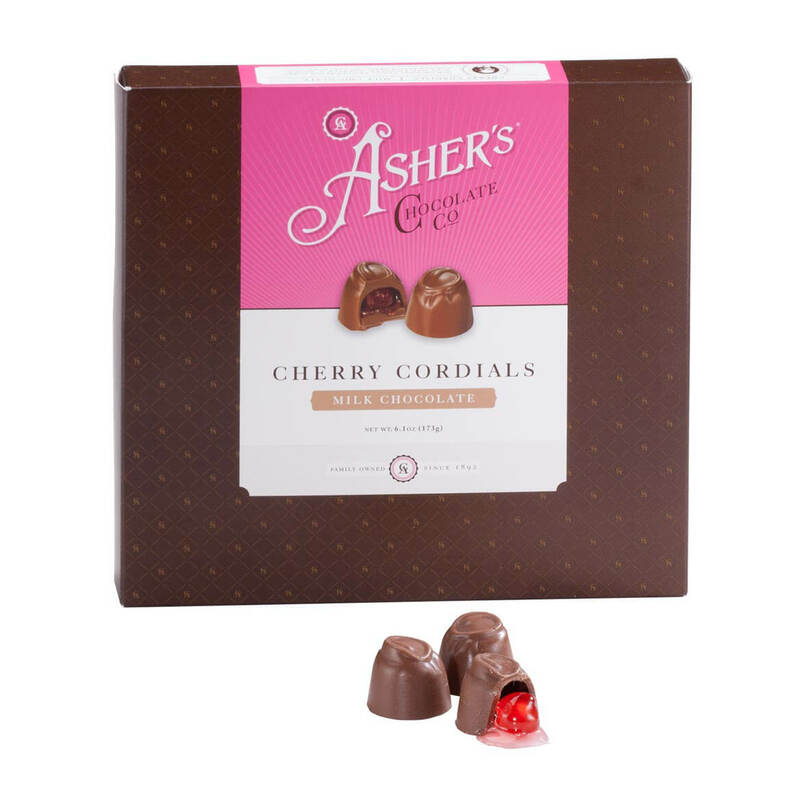 Creating fine chocolates since 1892, Asher’s crafts these milk chocolate cherry cordials with the freshest, finest ingredients. The classic treats feature rich candied cherries in sweet, gourmet syrup, generously drenched in velvety house-blended gourmet chocolate. A luxurious pleasure for any occasion, the plump, juicy chocolate covered cherries are handsomely packaged and perfect for giving. 6.1 oz. You’ll find our classic nonpareils candy to be just as rich as the chocolate nonpareils from your childhood! 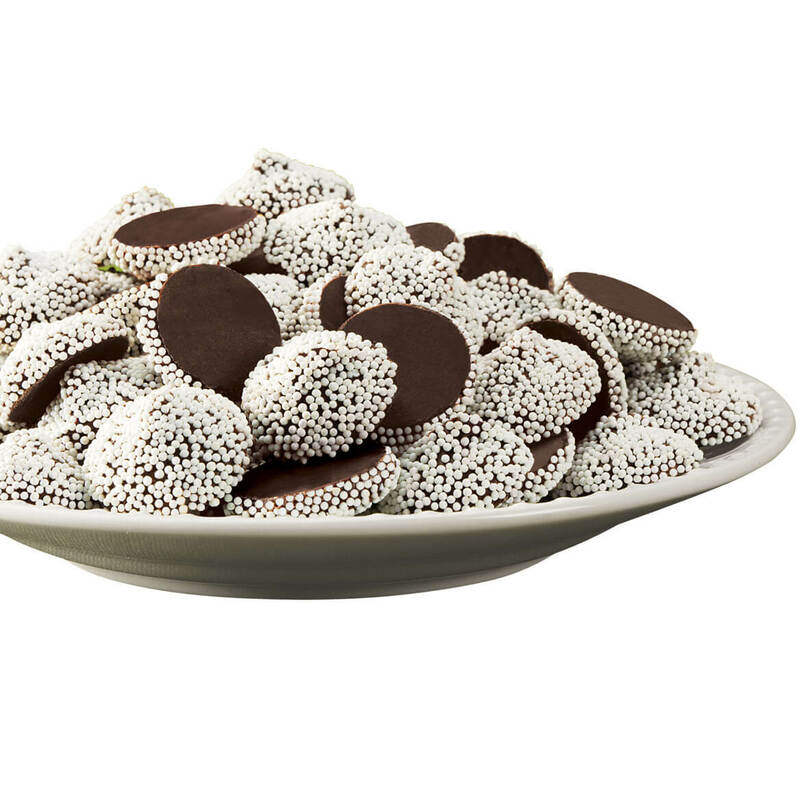 These dark chocolate nonpareils live up to their French name—being second to none! The classic combination of smooth, dark chocolate sprinkled with tiny white sugar beads provides sweet satisfaction that’s truly unrivaled. 19 ounces. Asher’s® gourmet Milk Chocolate Creams include something for everyone with rich, flavorful lemon, orange, maple and raspberry centers. Each luscious, lightly whipped center deliciously compliments the silky milk chocolate coating, treating you to pure satisfaction that satisfies even the hard-to-please palate. The classic cream-filled chocolates are a luxury you’ll be proud to give or serve … and sure to disappear quickly. 8 oz. Ohio’s beloved Buckeye candy now has a touch of sweet raspberry jelly—the perfect accompaniment to its smooth, creamy peanut butter center! 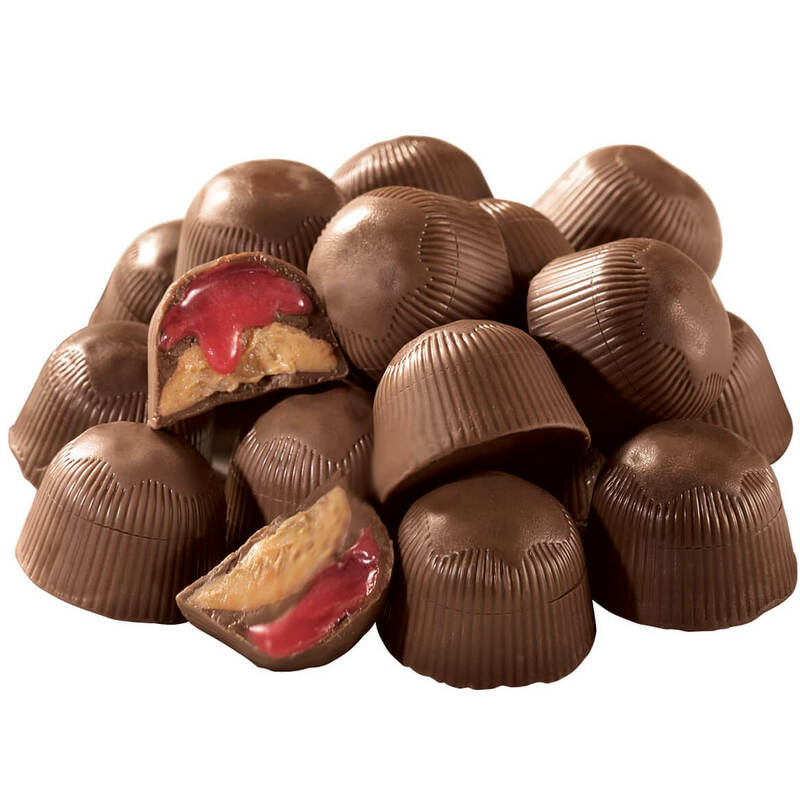 Decadently drenched in rich milk chocolate, these incredible peanut butter & jelly buckeyes delight candy fans of all ages, appealing to the PB&J lover in all of us! Individually wrapped Buckeyes come nestled in a generous tub for giving or serving. 14 oz.